Everyone is welcome to leave Comments on posts. Comments are moderated and the Faculty Center reserves the right to delete any comment at any point in time without notice to the party that submitted it. Imagery used on the site is either owned by the University or appropriate attribution will be given to artists that allow open-use of their work. If you like a particular Post or Comment, please share it using one of the social media (Twitter, Facebook, Google +) icons on the site. 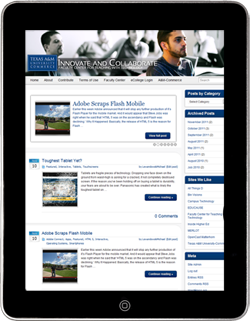 Only faculty members of Texas A&M University-Commerce are allowed to become contributors to the site right now. Contributions made by faculty are subject to the same rules as outlined in the Faculty Handbook and the University Graphics Standards manual. Posts will be reviewed and are subject to editing by Faculty Center staff prior to being accepted and published on the site. Possible edits include but are not limited to: changes to imagery, re-categorization, and repairing broken links. Imagery may be changed or deleted entirely if it violates copyright law, fails to give appropriate attribution, does not meet graphic standards or is deemed inappropriate. Inappropriate use or misuse of the site will result in the loss of Faculty Contributor privileges. If you’re a faculty member of A&M-Commerce and would like to post content to the blog, become a Faculty Contributor.